Gail Gladding-Pullara of Oregon, Wisconsin, won honorable mention in our 2012 Best of the Midwest Recipe Contest for this simple, crowd-pleasing soup. "My family loves this recipe," she says. "It's easy and tastes like you've been cooking for hours." Meanwhile, in a Dutch oven combine chicken and beef stock and undrained tomatoes; bring to boiling. Add ravioli and cook 7 minutes. Add sausage and return to boiling. Stir in spinach to wilt, then add basil. Divide among soup plates and top with cheese. This soup is delicious. 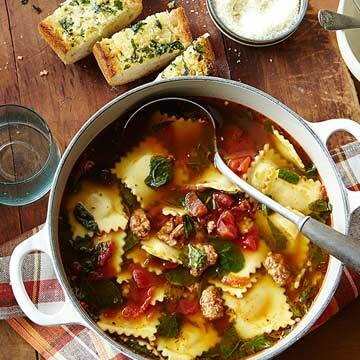 Don't miss out on the Parmesan, it really adds to the flavor and makes the broth fabulous.